South Florida in the garden: It is July now and you have decided that you want to be ready to grow vegetables for your family when our first planting time comes NEXT MONTH!?! Yes, some of us will start putting seeds in as soon as August. Don’t worry you don’t have to. September and October are great starting months too. If you are just starting out lets take this slowly and make it simple and pleasant. You could easily be ready by September 15th. First things first. You have to choose a proper location for your garden. You want this as close to your kitchen as possible. It should be easy to harvest and carry vegetables in to your kitchen each day. You should be able to dash out to the garden on thanksgiving day for a bunch of parsley without missing a beat. You need this garden to be in close proximity to a water source, like your hose spigot or your rain barrel spigot. Finally this garden spot must get a great deal of sun. It should not be up against the house, or under the trees, or even too close to a tall hedge that will block southern sun. Remember on December 20th you will be hard pressed to get 6 hours of sunlight anywhere on your property, and most of the day’s sunlight will be coming in from the south, and that is during the absolute middle of our growing season. If there is some natural block from the north and the west that is a bonus as it will help your garden stay warm on the coldest nights in the winter, but I would make that a low priority in choosing a garden location. Now you have your location planned out. You have to consider the shape of your garden and the square feet you hope to cover. I recommend you plan for a large garden but make it in smaller sections over the course of seasons. Since you never want to step into your garden soil your gardens should be narrow enough to get at from the edges, and accessible from both sides. It should be at least four feet wide, and if your arms are long five feet wide. Most of us will make long straight rectangles running parallel to one another, some of us make long rectangles that are at right angles to one another, but there is no reason you can’t make long curved gardens either, or spirals or rings going out from a smaller center. Just remember to make it easy to get from one side to the next. Once the garden is growing you won’t be able to jump over it. When making the shape of your garden you must also consider how one part of the garden will shade another part, and whether you can use that to the advantage of the garden, or if it will make your garden more difficult to plan when it comes to planting. Some people put their compost pile right in the middle of their garden or gardens. Can you imagine the various benefits of that? What about a small rain catch pond right in the middle of your garden? The sky is the limit with this and the more diverse your garden is the better. Consider also the orientation of the garden to the sun. Do you want it to run north and south with the long sides to the east and west, or would you rather run your garden east and west with the long sides to the north and south? Consider with a garden that runs east and west with the long sides to the north and south one side of your garden will get a great deal of southern sun, so you may plan to have your taller plants on the north side so that the plants beside them don’t shade them, or you can do just the opposite if you want a crop that would benefit from some cover from the sun. That might mean early or late lettuce crop planted north of the south facing peppers or eggplant or peas. That could be a good thing, but for a more uniform sun exposure for the whole garden you might want to orient the garden so that the long sides face east and west. You can see why some people do their gardens with right angles so that they can take advantage of both situations in different beds. Finally in your garden plan you should consider what you want to grow. It doesn’t make a bit of sense to plant lots of lima beans and squash if you don’t like eating lima beans and squash. Plan to grow what you and your family love to eat, and be careful to plan successive plantings rather than planting up all your square feet on the day you begin. Ideally you want to produce just what you can use, share or put up, and have a succession of crops throughout the growing season. I have often made my plans by drawing a picture of my garden and writing in the crops I intend to grow in pencil. It helps me to see what will grow tall or short, and what will come quickly and then be replanted or replaced. By making a photo copy of your garden pics without any crops written in you can make a different picture for every 4 weeks or so. Those pictures saved up will also help you when it is time to plan the next season so as not to repeat same crops in the same place. What you can’t know going in is how much lettuce a 4′ row of seeds will make, so be conservative in your planting. When it comes to lettuce I always get more than I expect, I don’t even realize when I harvest how much I am cutting until I get it indoors, washed and into the bowl. It is always too much. Fortunately fresh cut cleaned and dried lettuce will last over ten days in the fridge.. try that with grocery store lettuce! Lettuce should be planted as often as every two or three weeks to keep your family in fresh greens all season. Now the garden itself: Last summer while making new gardens I was making garden boxes as in my articles about the no dig garden prototype 2. Several of my older beds and one of the new 2008 beds were mounded beds. They performed beautifully and I didn’t have any trouble with the edges falling. This summer my new gardens are all mounds. I am not bothering with boxes at all. I am skipping the whole buying lumber and putting it together and leveling it and staking it on the ground. You can too. Without boxes you can make your garden into shapes that are more organic (curvy as opposed to straight), or you can stick to the long straight rectangle. If you still want to use boxes on the ground use 2×10 untreated lumber. So here we go again. This is the recipe for a garden mound or box right on the ground with no digging that will be ready to plant into in a couple of months. Lay down 1/4″ of newspapers, or some cardboard, and wet it (That is a weed guard.). Lay down 4″ of Alfalfa Hay, and wet it. Lay down 1″ of Livestock Manure and wet it. Lay down 4″ of Straw, and wet it. Put down another inch of Livestock Manure and if you have compost put it down now finished or not 4″ thick. If you don’t have compost started but you have or can find a bag or two of brown leaves put them down on top of the manure (the more chewed up those leaves are the better, that is, run them through your lawnmower because if they are too big or thick like Seagrape leaves they will not break down quickly enough), wet them and put down another inch of manure, wet it and cover it over with about 3 more inches of straw. That last straw will be your mulch when it is time to plant. It should go on thick enough to keep weeds from growing up through it. Expect some of the seeds from the straw to sprout. You can allow them to root and chop them down, or pull them and let them lay on the straw to decompose. Both ways are beneficial. I know it is hard not to pull weeds. I’m there with you, but it isn’t always necessary or even best. If you don’t have compost, or leaves then you will have to go to the store and buy (sorry) some bags of composted cow manure (which is no longer manure, but black soil made from manure) and put the store bought composted cow manure 4″ deep on top of the livestock manure layer over the 4″ of straw and then cover that over with the straw mulch, and give it some time. I believe bags of composted cow manure from the store might be a little short on biological life and will need time in your garden mound to generate some microbial life. Don’t worry, it won’t take long. Now remember straw and hay come in compressed bales. When we put straw and hay into the garden we have to decompress them, or unzip hehe. So take a few layers at a time and shake them out like you’re shaking salt. When I say 4″ I mean four fluffy inches, not four compressed inches, and don’t forget to wet each layer as you put it down. We are asking this garden bed to compost itself, and it will. When I make a bed 4′ by 8′ I use about a quarter bale of Alfalfa and about a third of a bale of Straw. Next year at this time you will do much less to prepare this bed for planting again, but that is for another post. Read about the differences between Straw and Hay in Hey, Straw Ain’t Hay. Now don’t ever step into this bed or compress it. 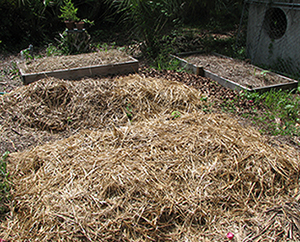 When it is time to plant if we are planting little seeds like carrots or lettuce, peppers, eggplant, or tomatoes we will move the straw over in rows and gently lay the seeds into the surface of the exposed soil and sprinkle some soil over them. If we are putting in big seeds like beans or corn or squash we will just make a small finger hole in the straw and push the seed a little way into the soil beneath. Here is a question for you: Is this mounding procedure a sustainable practice for us the way it is done in this post? If you have an answer please post your yes or no answer with why you think this is or is not a sustainable practice, in the comments link at the bottom of this article. In a future post I will write about some of the crops that you might want to plant in your mound, and where to put them in relation to other plants, and when to put them. Stay tuned. Yeeeee. Are you excited? I know I am. Now get to work. Previous: Previous post: Hey, In The Garden Straw Ain’t Hay! I have a problem. I only place I could put my garden is on the northside of my house. only 1/2 of it gets good sun. What do you suggest that I plant in the shady area? and what do I do about those little spider bugs, they killed half my garden last year. Please help really trying here. My fiance’ build me a composting bin last month. How soon will it take until I can use it? ps Thanks for you site u have helped me so much.!! Hi Tracy, Thanks for your comment. You have a serious problem for sure. You may find that you can plant early and late lettuces in the shady area, that is you may be able to plant lettuces there earlier and later in the growing season than most of us, while it is hot and bright out, but by November, and through February the days are too short and the sun is traveling so far south that a garden blocked from the south is too shady for any vegetable I can think of. Your spider mite problem might be relative to the lack of sunlight there… right plant right place, you know what I mean? The shady garden might make an awesome hot season growing spot only. As you may have noticed I don’t really advocate any active type of pest control. I have found that insects usually only attack or have an effect on weakened plants. Weakness in our gardens can be caused by nutrition failures.. not enough sun means not enough photosynthesized nutrients, and poor soil is also a nutritional failure. Inappropriate timing, putting a plant in too early or late in the season for it to thrive will also cause weakness which attracts insect problems. You might consider what is called biointensive, or french intensive gardening as a style of growing for the bit of garden that gets enough sunlight. It is the way that gardeners create the most food in the least amount of space possible. You may find you can grow plenty enough for your family in the sunny part of your garden, and use the shady part for composting. I hope this has helped you Tracy. Feel free to call me (check out my contact info. on the page called Consulting) or stop by the green market in Fort Pierce, if you are local, (I am in the worm/soil amendments booth).